By comparison, under its proposed Climate and Green Plan Implementation Act, Manitoba is proposing to rebate part of the revenues from its $25/tonne carbon tax in the form of an increase in the value of the Basic Personal Amount by $1,010 in 2019 and again in 2020. The Basic Personal Amount (BPA) is a non-refundable tax credit. All Manitobans can claim this amount and are therefore not taxed on taxable income below the BPA. The government was elected on a promise to raise the BPA in 2016 and re-profiled this commitment as a carbon tax rebate. The following table compares the value of these two rebates for families. Were Manitoba to design a similar rebate program as the B.C. one, for a budget of $83 million, it could offer an enriched rebate featuring a maximum of $157 per adult and $50 per child. 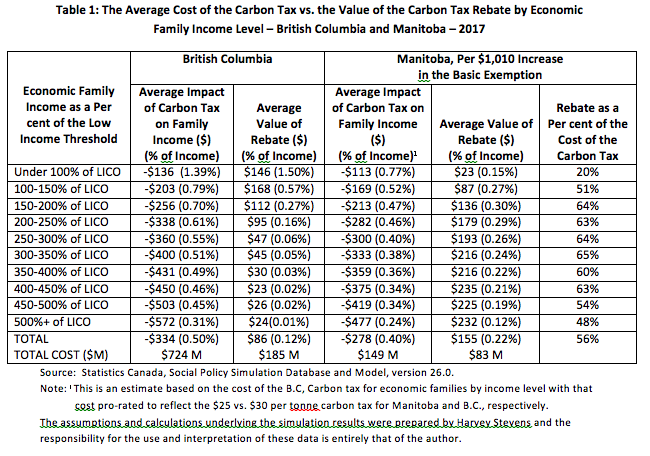 Such a program would have the following impact on family income (see Table 2). 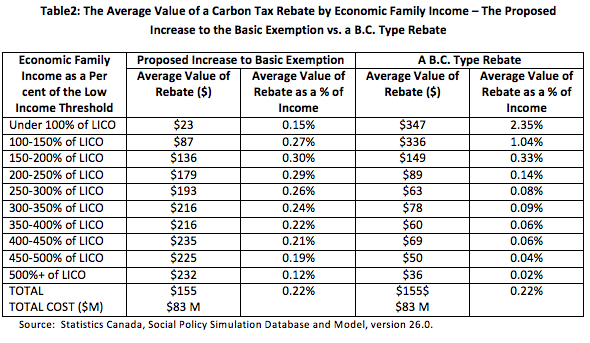 In comparing the two distributions of net rebates, one can see that a B.C.-style rebate would result in higher benefits for those families with incomes less than twice the low income threshold. Harvey Stevens is a retired senior policy analyst with 20 years of experience with the Department of Family Services and is currently a Professional Affiliate with the Department of Economics at the University of Manitoba. He also sits on the policy committee of the Green Action Centre and is a founding member of the Manitoba Carbon Pricing Coalition.